You can read the original story, complete with audio from the ceremony, at this link. 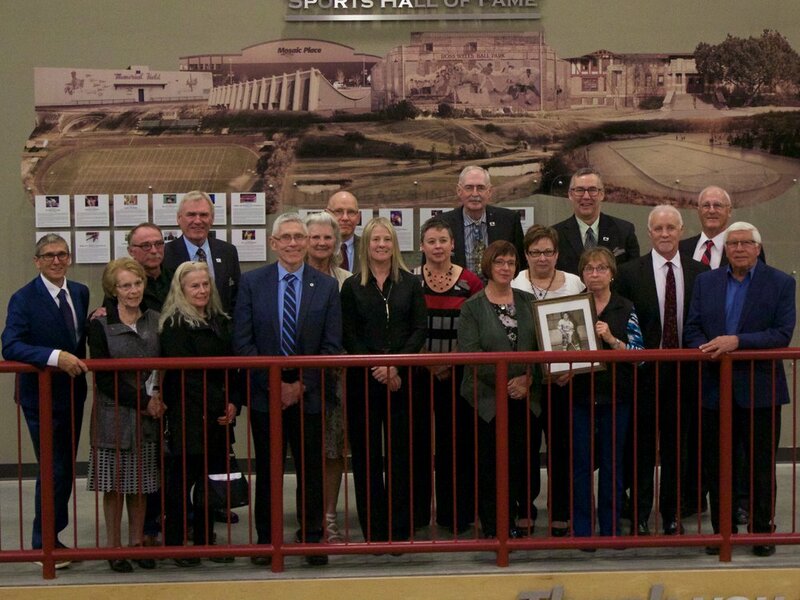 There were a lot of laughs, a few tears, and a whole bunch of stories being shared on Saturday night at Mosaic Place, as the Moose Jaw and District Sports Hall of Fame hosted its fourth annual induction banquet. Going into the hall this year were: baseball and curling builder Roger Anholt, baseball player and builder Jim Baba, minor and high school sports builder Hub Gutheridge, baseball and hockey player George Hunchuk, Olympic figure skater Susan Humphreys, and NHL star Doug Smail. They join the 16 previous individual and two teams already inducted into the hall, which honours the history of sports in Moose Jaw and the surrounding area. Doug Smail’s life in the game of hockey started right here in Moose Jaw and there were many local people that played a part in the small-town player living the NHL dream. "The bottom line is if it takes a village to raise a child, it takes a city to raise an athlete," said Smail. "There were so many people in my life that had an effect on me, from my Mite hockey to teachers in high school and family friends, adopted fathers — Roy Ashworth, John Hunter, and Bevin Leipert were tremendous influences on my career and how it shaped my life." Smail starred with the Moose Jaw Canucks in the Saskatchewan Junior Hockey League, winning the league scoring title and MVP award after posting 60 goals and 116 points in 57 games. The small speedy forward went onto the University of North Dakota, where he won an NCAA national championship with the Fighting Sioux in 1980. After that, Smail joined the Winnipeg Jets in the National Hockey League, signing the largest free agent contract for a college player at the time. He played 845 games between Winnipeg, Minnesota, Quebec, and Ottawa, registering 210 goals and 459 points. "I was just a kid that was pinching himself every day for 13 years and that’s the honest truth, I felt very fortunate to be there," said Smail. Smail now lives in Colorado where he gives back to the game coaching at the midget AAA level. Susan Humphreys went from the ice in Moose Jaw to the biggest stage in the world at the 1994 Olympics. Humphreys said that she never forgot where it all started, "I have very fond memories of this town, the old Crushed Can, six in the morning and going skating there. This was my formative, early years growing up here," she said. Humphreys moved to Vancouver when she was ten years old, but she learned to skate in Moose Jaw under the tutelage of her aunt, Carol Humphreys, who Susan credited with instilling her love of figure skating in her. "She was our biggest support and she had a very big impact in our participation in the sport," said Humphreys. "Carol was so passionate about skating, all the way from the time I was little to the last time I remember seeing her, skating was everything." Humphreys participated in the Canadian Figure Skating Championships from 1989-97, including becoming the national champion in 1997. She competed in her only Olympics during the 1994 Games in Lillehammer, Norway. Humphreys now lives in Edmonton with her husband and three children and she continues to hit the ice to work as a skating instructor, including working with current Moose Jaw Warriors forward Tyler Smithies. Jim Baba continues to work in the game of baseball to this day. His love of the game began on the dusty diamonds in Moose Jaw and has carried him through a college playing career, a coaching career that took him all the way to the national team, and now on the administrative side of the game at the highest levels. "I’ve got to give credit to my dad (Farris Baba), that was the sport that we always liked and did, he actually cheated on my age to get me started a little bit early, but just his passion for the game and his love of game fell over onto me," said Baba. Baba saw success right from the beginning, coming one game away from making it to the Little League World Series in his childhood. He would go on to play college baseball at Yakima Valley, he led the team offensively on their way to the state title in 1976. During that time, Baba also played, and coached for four seasons, with the Moose Jaw Devons in the Southern Baseball League, winning the batting title in 1973 and 1974. Baba started to move off the field after that, working with Sask First at the Canada Games from 1989-95, helping the province to a silver medal at the 1989 Canada Games. Baba would go on to become a national instructor with Baseball Canada, then an assistant coach with Canada at the 1991 Pan Am Games, and then he was the head coach of Baseball Canada’s national team from 1993-98 and again in 2003 and 2005, capturing bronze at the 1994 World University Games and a fifth-place finish at 2003 World Baseball Championship. 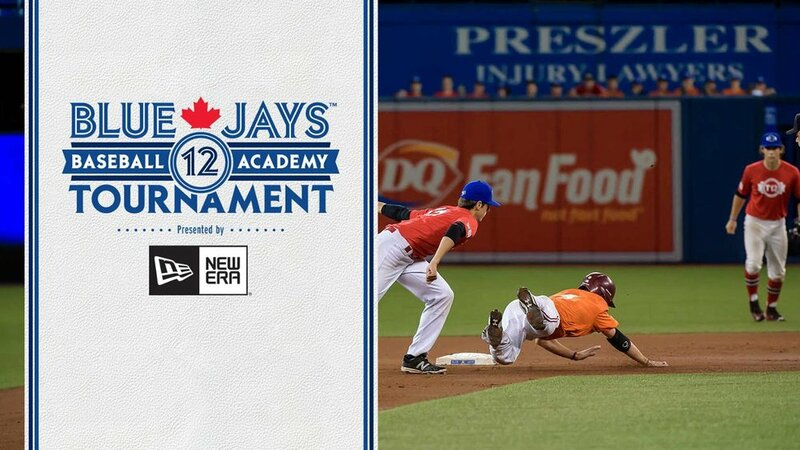 Since 2000, Baba has been the Executive Director of Baseball Canada and he served as Technical Director for the 2015 Pan Am Games in Toronto where Canada won gold in baseball, beating the United States, 7-6, in extra innings. "The experience in sports, like coaching national teams, gives you a tremendous feel about the game and being a part of a sport, so you just carry along with your passion for the game and then for something like this to happen and you get inducted into the hall of fame, it means a lot, this is my home," said Baba. Baba has previously been inducted into the Saskatchewan Baseball Hall of Fame as an individual in 2007 and with the Moose Jaw Devons/Regals in 2015. It takes a lot to be a legend in two sports, but George Hunchuk accomplished that. Hunchuk was being inducted posthumously on Saturday after passing away in 1996 at 69 years old, but his daughter Cathie Hunchuk said this would have been a special honour to him. "He loved Moose Jaw, of all the sports hall of fames to be inducted into, this one is it, this one would have meant the most to him," said Cathie Hunchuk. "He’s in the baseball hall of fame in North Battleford, he likely should have been in the hockey hall of fame in Swift Current, but when Moose Jaw created their own, there was no question that he should be here." Hunchuk played professional hockey for three seasons in the American and Pacific Coast hockey leagues from 1947-51 and he also had a tryout with the Chicago Cubs in 1950. Hunchuk eventually settled back into Moose Jaw where he played senior and eventually old-timers hockey, as well as baseball at all levels into the 90s. For 15 seasons, Hunchuk settled in behind the plate as a top catcher in the Southern Saskatchewan Baseball League where in 1960 he won the batting title with a .383 average. In addition to his sporting exploits, Hunchuk was also involved in the community, serving as a Moose Jaw City Councillor from 1970-88. Hunchuk was inducted into the Saskatchewan Baseball Hall of Fame as an individual in 1998 and against with the Moose Jaw Regals in 2013. Gutheridge Field is a staple of the Moose Jaw high school sports scene every fall during football season and every spring for track-and-field season. Without Stanley Herbert "Hub" Gutheridge, it might now exist. Gutheridge was inducted into the hall on Saturday as a builder in athletics in Moose Jaw following decades of work with minor and high school sports in the city. "I know he would be humbled and honoured to be named to the sports hall of fame," said Jeff Lott, Gutheridge’s grandson. "Grandpa was just a great man and set a good moral standard for our whole family." Gutheridge was involved with many local and provincial organizations throughout the years, including the Moose Jaw Basketball Association, Canadian Red Cross Water Safety Program, Royal Life Saving Society of Canada, and Saskatchewan High School Athletic Association. He held executive positions in each group and was a certified instructor and official in basketball, track and water safety. Gutheridge Field on South Hill was named in his honour in 1972 after he was a key figure in getting the facility built. "I always remember going over to stay with him and it didn’t matter what day of the week, he had a shirt and tie on, and it was because he had meetings and it didn’t matter which day of the week," said Lott. Gutheridge passed away in 1990 at the age of 85. 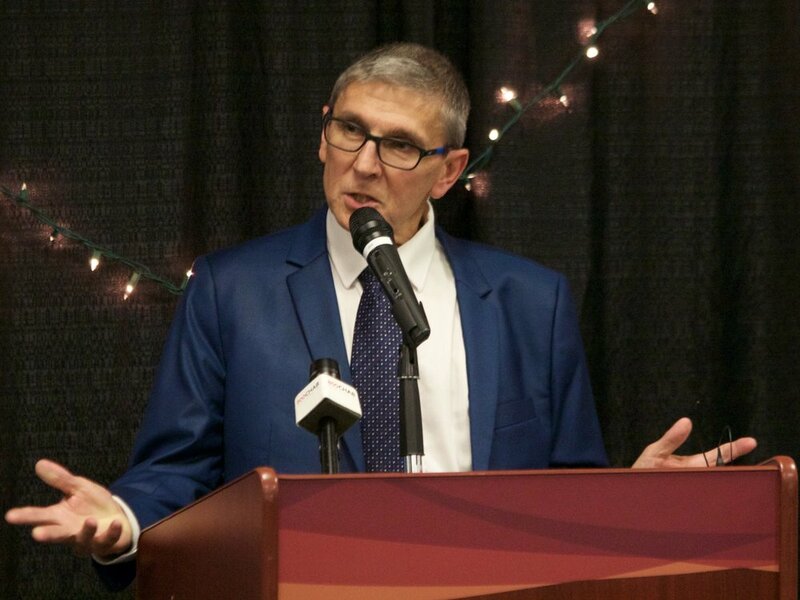 Roger Anholt speaks at his induction into the Moose Jaw & District Sports Hall of Fame on Saturday. The former teacher at Peacock Collegiate was inducted on Saturday as a builder in both curling and baseball. "This is kind of humbling when you take a look at the names that are already on there, the athletes get there because of their ability and I’m there because I surrounded myself with good people," said Anholt. "We had a lot of good kids with us and most of our teams were all quality players and the kind of player that we wanted as a good human being." 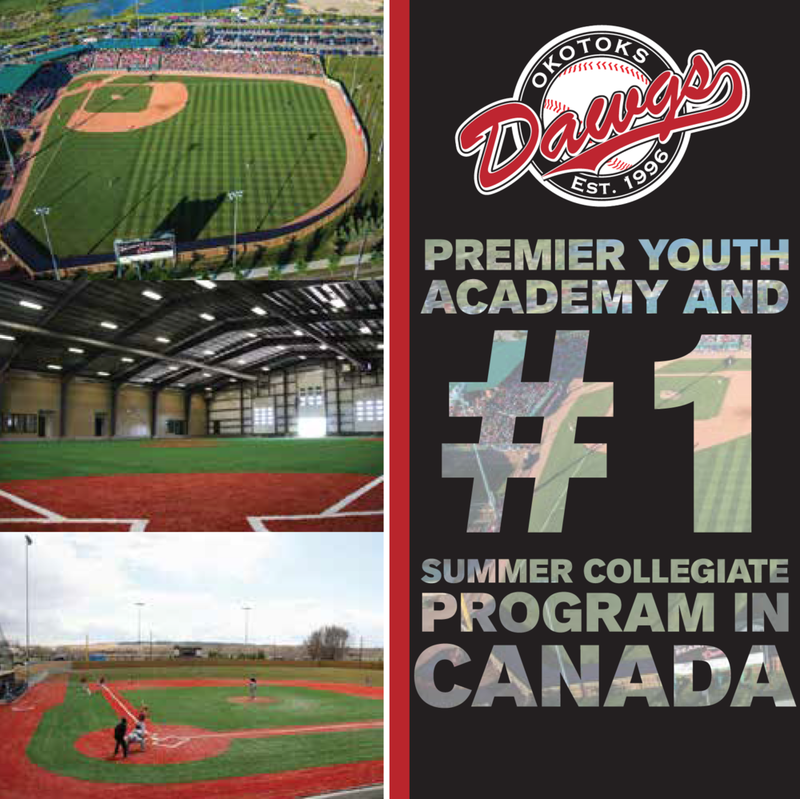 Anholt helped form the Moose Jaw Minor Baseball Association after breaking away from Moose Jaw Little League with the Moose Jaw Bantam Cardinals in 1990 and winning the Western Canada Bantam Championship in 1991. Eventually moving up to the Midget AAA division and winning a provincial title in 1997 and 2000, Anholt would coach the team for 21 seasons. In curling, Anholt’s Peacock teams won eight provincial titles, gold at the Saskatchewan Winter Games, 16-and-under Provincial Championship, and Junior Provincial Championship (1996, 1999, and 2000). The 2000 team also walked away with bronze at nationals and Anholt won the 3M Coaching award. Anholt also coached Team Saskatchewan at the 2006 Scotties Tournament of Hearts. He’s won a total of 18 awards for coaching over the years.